About "A Footpath in Umbria"
Being a homebody, Nancy never would've spent a year in Italy had it not been for her husband's wanderlust. The couple didn't go there to buy or restore a house or to heal a trauma from the past. As ordinary boomers, they simply wanted to experience "The Dream" ... to live in Italy. They settled down in traditional Umbria, just east of Tuscany. Constrained by a strict budget, their experiences took on challenges as diverse as getting accustomed to the vagaries of Italian appliances to gathering their own wood. Transportation was by train, bus, bicycle or footpath. What neither of them knew when they began was how the adventure would challenge their habits, upbringing and outlook on life. Most surprising of all was how the experience would challenge their relationship to each other. A Footpath in Umbria is a celebration of the joys and revelations to be found by changing venues, whether it is living in another country or simply venturing cross town. ​For some, traveling is a dream come true. For others it's a nightmare. Either way, traveling has a way of testing one's mettle. Where each of us falls on the scale of "ability to cope" varies. The questions is: What separates a hearty traveler from the not-so-hearty one? Perhaps it lies in one's ability to cope in a spirited and resilient way. Nancy coped while in China, but not always with spirit and resilience. She's more of a reluctant traveler, an accidental tourist. In this memoir, she visited China three times, not because it was a lifelong dream of hers, but because of her son. She spent two weeks in China when he was a student, then one week when he was the groom and, finally, five weeks when he was the Chinese language high school teacher taking American students to China in a foreign exchange program. Each trip brought many and varied challenges. During the first one, Nancy learned to set aside her instinct to use chopsticks as a fork and knife. During the second, she was unexpectedly called upon to speak publicly and, startled, stuttered and sputtered her way through a congratulatory speech. And during the third, each time nature called, she was reminded that something had drastically changed since her first trip 14 years earlier—her leg muscles, which used to easily raise her up from a squat, betrayed her. 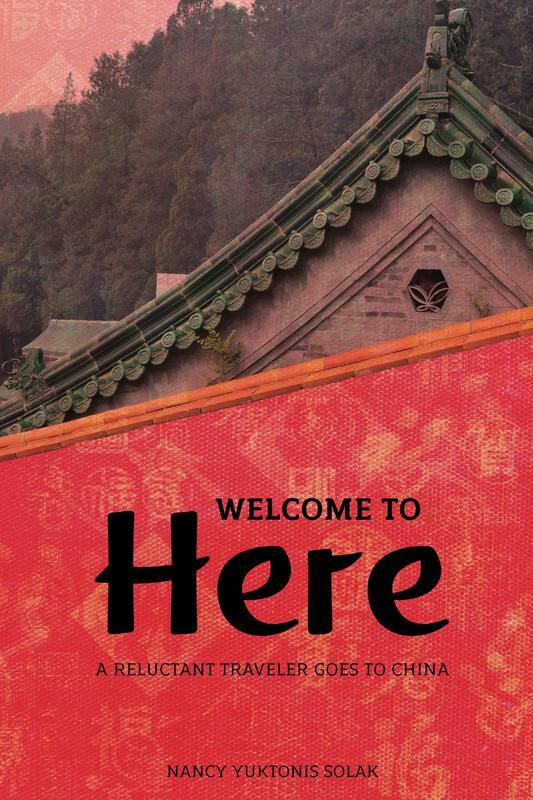 Now, thanks to Nancy's second photo-studded travel memoir, Welcome to Here: A Reluctant Traveler Goes to China, you can experience the country in all its glory and challenges without leaving your favorite reading place.